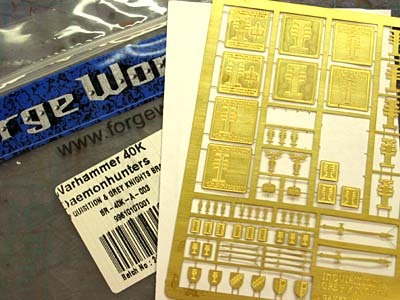 So apparently, it's pretty easy to use the fancy brass etchings from Forge World. I recently picked up a drop pod commission (for a Deathwatch squad) and adding the Forge World Inquisition etchings was a breeze. All I used was my trusty X-Acto blade to cut them from the sheet and then trim away the last little bit of excess along the edge and I was good to go. A word of caution though, these things are tiny and can be difficult to handle and glue into place. I used the tiniest amount of superglue and it was more than enough for these... use too much and it will spill out from behind the edges and make everything a mess. I added a seal to the outside of each door and then a smaller one on the inside as well. 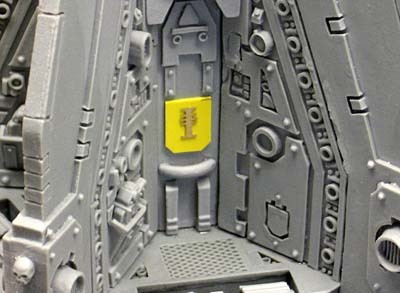 I needed to use a small piece of plasticard to cover an opening in the back wall of the pod (it's the old FW resin drop pod and it came from ebay already assembled). Once painted though, you'll never know these were added after the fact. It's amazing the amount of detail in these things. Now I just need to figure out a suitable paint scheme for this model. Here's trick to adding smaller brass etch to models. Told ya they Rocked. If you ever need a bit or two off mine, lemme know. Resin chapter add-ons are nice too. The Dark Angel ones are stellar in fact. I wasn't a big fan of the Blood Angels resin chapter symbols I got from Forge World. The brass etch was fine but the resin was really thick and didn't look right until I'd sanded it down considerably. I just found that more hassle than the expense warranted. The drop pods scare me too! They have so much detail...how to decide on all the colors to use! I am glad to see someone actually post a article about working with the brass etchings. I have been thinking about ordering some as a more cost effective way of adding Imperial Eagles to my IG force. It's Daemonhunters, shouldn't it be all weathered metal with red, white and black icon? Some brass/gold here or there? Anon: I believe so, now it's a matter of finding a good scheme using those colors. Well, Deathwatch should be primarily your favorite color, black, with some dark red (red gore) trim here and there. I always wondered if brass was worth the purchase. Thank you for confirming it. how did you get the inside to look like that?? 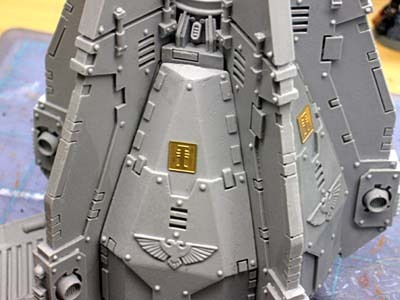 Captain: It's a Forge World drop pod so all that detail is there. The yellow piece is a small bit of plasticard that I used to cover an unused mounting hole. The =I= icon is glued on top of the plasicard piece.